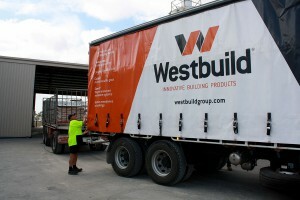 Delivering quality and value is the very foundation of Westbuild. 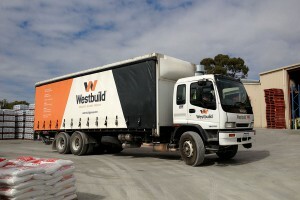 So we can ensure this in every aspect of our business, Westbuild operates its own fleet of rigid trucks and truck/trailer combinations so we ensure fast and efficient delivery to our retail partners. Should you have a large order from one of your customers, unexpectedly run low or be out of stock, a simple phone call to Westbuild is all that is required. You will receive immediate attention and be assured that your order is allocated the highest priority to a faster delivery slot. Our distribution network, with stock on hand in Perth, the Southwest and Great Southern regions, assures your delivery as direct, swift and efficient. Our manufacturing is strategically located in the north of Perth. We supply to all parts of the Perth metropolitan area, including northern and north east regional areas of Western Australia. Our South West distribution centre is located centrally in Bunbury, in close proximity to all major arterials for the region. This centre supplies all areas of the south west. With good stock holdings, we can ensure this region of the state receives the same distribution service as if they were within the metropolitan area. WESTBUILD is wholesale only and does not sell directly to the public, however please contact us for the location of your nearest tile merchant, hardware or trade centre.